About Melbourne ParkAfter so long without a home of their own the club were hugely grateful to the local council for helping them return to the city in January 2006 with the opening of Melbourne Stadium as a multi-use venue. Whilst the club have ambitions to own their own football only stadium they continue to do the necessary work to make the ground as good as possible for spectators. There is one large main stand, with a few rows of terracing at the front, a few rows of seats on the far side of the ground and then temporary terracing (around 4 steps worth) behind each goal. Views aren’t good from anywhere due to the athletics track, and in the winter when visibility is reduced it is hard to make out what is going on on the pitch.How to get to Melbourne ParkFrom Junction 28 of the M25 join the A12 sign-posted Chelmsford. After approximately nine miles take the exit sign-posted Chelmsford/Harlow. You then join another dual carriageway which will take you past a golf course and countryside on your left hand side. Continue along this road (for approximately two miles) until you reach the first of two roundabouts (they are close together). You then go straight across the first roundabout (note at this roundabout anyone driving in on the A414 will join). The A414 joiners should turn left at this point and drive up to the second roundabout. At the second roundabout you take the first left, signposted Chelmsford Crematorium/Widford Industrial Area. Again you keep straight on this road, following the signs for the Town Centre and Hospital A&E. Along this road you will notice a Nissan Garage on your right and later a Fire Station, also on your right. After the Fire Station you are nearing the final set of lights on this road. Keep left as you approach these lights. As you go through the lights keep left and enter the slip road. Ahead is a road signposted A1060 Sawbridgeworth. Take the A1060 turning (road name Rainsford Road). Stay on this road, through first set of lights. At second set of lights go into the right-hand filter lane and turn right. This takes you into Chignall Road. Stay on this road for a short while before turning right into Melbourne Avenue. Ahead you will see a tall block of flats, turn left immediately in front of them into Salerno Way. The entrance to the Stadium is via a left turn at the next mini-roundabout. In order to make a 15:00hrs Saturday kick-off the latest train you should catch from London Liverpool Street is 12:48 to comfortably make kick-off and from Ipswich you’d need to catch the 12:42. To make a midweek 19:45hrs kick-off, leave London Liverpool Street no later than 18:22 and Ipswich by 18:11. There is a Taxi Rank at the rear of the station and the applicable Bus Route runs from the other side of the road, under the viaduct at the front of the station while the Bus Station is being rebuilt. The above directions are provided by the official Chelmsford City website.How to get a ticket for Melbourne ParkWhilst the capacity is relatively small at Melbourne Park at just over 3,000, and average attendances are high, around 1,400, turning up on the day is never an issue here. The is one set of turnstiles, at the end of the main car park and entry is £10 for a place on the terraces for Adults, and £3 for children with an additional £1 each for a transfer to the main stand.Our Last Visit – March 2011 The thought of having to watch my football in a half empty athletics stadium is as appealing as watching a DVD box set of KerryKatona and Katie Price’s TV highlights. From significant experience of watching games overseas in grounds where you are up to 30 metres from the action I cannot remember one match which I can say was watchable when played in such a stadium. I’ve been to some of the best in the world – Berlin’s OlympiaStadion, Barcelona’sMontjuic, Istanbul’s Ataturk and Vienna’s Ernst Happel, and I’ve been to some of the worst – Rotherham’s Don Valley, Brighton’s Withdene and Moscow’s DinamoStadium. And the one thing that links them all is the fact that there is very little atmosphere, and this translates to the players. Are you listening Sullivan, Gold et al? Of course not. Our good friend Ian King wrote in When Saturday Comes this month about the real losers in the whole Olympic Stadium farce were of course the fans who simply weren’t consulted. As a club member at West Ham I can certainly agree with that, never once having been asked my opinion about the move. Perhaps they should have spent some time lower down the leagues to see what it is like in England playing in such arenas? In the Blue Square Bet South there are some nice traditional stadiums such as Braintree Town’s, Hampton and Richmond Borough’s Beveree and of course the Dripping Pan. There are someidentikit newer grounds such as Eastleigh’s, Bishop Stortford’s and Staines Town. And then there is Chelmsford City’s Melbourne Park. Yes I know the history, and yes I am sure the club are very pleased to have a ground to call home after their time as nomads playing in places likeBillericay, but it still doesn’t get round the fact that it is an athletics stadium. They had tried to be a bit different in the fact that behind both goals they had put in temporary small terrace areas so that fans here were close to the action, but the covered seats sat some 20 metres back from the pitch meaning binoculars were as essential as a scarf on a chilly afternoon in deepest, darkest Essex. CMF had declared today as a “Girls day out”, which initially I assumed to mean that she would be looking after the little Fullers meaning I could get the train to Chelmsford with the rest of the Lewes Lunatic Fringe and have a few beers. Oh no, “Girls day out” meant CMF and her chums going out from 12pm on the piss, returning with a thong of a male stripper in her pocket and whipped cream around her mouth at 3am. So the little Fullers would be also making the envious trip to Chelmsford. Not an issue for Lolly but for Littlest Fuller it meant I had to be a bit creative in selling to her the positives of watching football instead of shopping. I had amused her a few weeks ago on a trip to the El Grande Classico Paradiso, aka The Canvey Island derby at Concord Rangers when I told that I had been asked to count the official attendance, and if she did it then she would get 1 pence for everyone in the ground. She took a good half an hour to use her fingers and toes to tell me it was 178 and then demanding £1.78 as her fee. I gave her £2 before Lolly was able to tell her that the official attendance announced over the PA was just over a thousand. With away trips running out for the Rooks this was going to be one of the last of the season for the whole Lewes Lunatic Fringe. Chelmsford doesn’t have that many pubs that could tick all of our requirement boxes – dart board, decent beer, child friendly, buxom barmaids with low cut tops. That is except the Woolpack, with its multitude of awards, games room and beers on draft such as Olde Skipper, Milk Street Amarillo and Wibblers. It was sure to be home to the legendary Viz cartoon characters The Real Ale Twats…and us of course for a couple of hours. However, they missed one simple ingredient. Food. What pub in this day and age doesn’t do food. After we had asked another chap came in and then went straight out when told there wasn’t any fayre on the menu. So we headed north for a couple of hundred yards and ended up at O’Connor’s. Decent looking bar, they served food (4 full Irish breakfasts please) and a nice beer garden gave us the Greek Island effect. Two other chaps arrived, who had also ordered the breakfast. First came the news that they had run out of eggs. Then sausages, and finally the toaster was broken. All highly embarrassing when ours arrived a few minutes later with said items on, plus what appeared to be a quarter of a burger (supposedly “White Pudding”). Still it filled a hole. Ten minutes later we were pulling up in the Athletics stadium. Danny and Dave flashed their Student cards but with the littlest Fuller’s in tow it didn’t worry me. “£18.50 please”. “WHAT? I said one adult and two under 10’s” “Yes, that’s right. Unless you want to go in the stands where you have to pay an extra £1 each.” “Hang on. £18.50 is 85% higher than you would pay at Lewes.” “It’s average price in this league” “Er no its not” A quick look in the back of their own matchday programme confirmed that their next away trips to Maidenhead and Bishops Stortford would be £14 and £10 respectively for the best seats in the house. Begrudgingly I handed over my cash and we entered the ground. In the distance we could just see the pitch, separated by not only an 8 lane athletics track but also the high jump and long jump tracks. “Get used to it Stu” Said Deaks as we looked onwards “This will be your view at West Ham in two years time, although it will cost twenty times more”. This game was the start of an unenviable treble of games against teams going head to head for promotion. With Farnborough Town (2nd) and Braintree Town (top) coming up next, this was the most “winnable” game on paper. And with the Rooks unbeaten away from home since mid January when they narrowly lost to Braintree Town hopes were high of at least a point from this one. Chelmsford City seem to be in the playoffs every season, and this year was no exception but they were fallible as recent results against Eastleigh and Hampton & Richmond Borough had proved. Yeah right….Chelmsford City 4 Lewes 0 – Melbourne Park – Saturday 12th March 2011This was painful. Not painful because of the poor view, the expensive admission or even the scoreline but because if one or two decisions or chances went the other way it would have been a different afternoon. Lewes started the stronger of the two although once the ball went into the box there was no one there with any semblance of an attacking instinct. Our Dave Wheeler had started this game and was a thorn in the side of the Chelmsford left bank who took to bullying tactics. All old school stuff. Sly little kick, pulling him up by his shirt when he had clattered into him and generally annoying him. After the initial attacking flurry it was business as usual. Winterton was soon called into action, making a couple of excellent saves from the unfeasibly tall Rob Edmans and Jordan Sanderson. By this stage the little Fullers had headed off to the tuck shop to spend my money on Cola Cubes, Rhubarb and Custards and Sherbert Flying Saucers – a throwback to when football was so innocent. I have quite sure that my Golden Goal time of 17 minutes was a good one, but amazingly the Rooks held out until the 29th minute when a knock down wasn’t cleared in the box and Gray turned and shot only for Winterton to get a hand to the ball but still saw it trickle over the line. One became two a few minutes later when DaveRainford’s mistimed header took Winterton by surprise and looked over him. Game over? Well, certainly in the first half. It was tempting to stay in the cavernous and impressive Supporters Bar after half time. Whilst I have been disparaging about the ground and the pricing policy, there is nothing wrong with the Chelmsford fans who passionately follow their team and the ones I spoke to wished Lewes well. Lewes actually started the second half the brighter, although Ben Hunt, with hisponcy blue boots on needs to learn to stay on his feet. Twice he theatrically fell to the floor, although it took him so long to reach the deck that the referee was already up the other end of the pitch. The Rooks earned a couple of free kicks in decent positions around the box but seemed reluctant to shoot. Twenty minutes to go and Edmans again showed how good his close control was for Peter crouch’s body double as he wandered through the defence, rounded Winterton and was about to shoot when the keeper took his ankle away. There was no option for referee Quelch, who was up until this point quite frankly crap, but to send off the keeper. And with no substitute on the bench it was Andy Pearson who stepped forward and put the gloves on. And his first job? Trying to save a penalty of course. Which he didn’t and Rainford made it 3-0. Five minutes later and Lewes’s tactic to try and get the game abandoned stepped up a gear as Jack Evans got a second yellow for, well, who knows. Referee Quelch again showed that he had no intention of refereeing at a higher level by being so inconsistent, allowing some crunching tackles to go unpunished (especially on Dave Wheeler) yet issuing two yellows to Jack”Kate Moss” Evans for his strong tackling. To add insult to injury Evans had to be accompanied to the dressing rooms by not one but two stewards “just in case he went postal” so another steward told us. Jobsworth more like. So ten minutes left and only two more red cards needed. Although the plan seemed to change when Callum Davies decided to aim an inch perfect shot into the corner of the net, although perhaps he shouldn’t have chosen his own one for his first goal of the season. Four nil, and enough was enough. It had been a painful lesson and an insight into the future that I didn’t like. Athletics stadiums are for athletics, football are football and never the two should meet. More pictures from a bad bad afternoon can be found here.Chelmsford City 2 St Albans City 0 – 5th September 2009 St Albans City, Chelmsford City, Worcester City, Stoke City. Four of the twenty one clubs in the top three levels of football in England that carry the suffix City. But are they allowed to? What defines a city? Well according to the Cambridge English Dictionary, a City is defined as “a large town that has a cathedral”. If this is the case why can Stoke call themselves Stoke City, and what about Manchester? as far as my local knowledge goes there is no cathedral in the city at all? Well, there is another definition. “City status is a rare mark of distinction granted by the Sovereign and conferred by Letters Patent. It is granted by personal Command of The Queen, on the advice of Her Ministers. It is for Her Majesty The Queen to decide when a competition for city status should be held. Competitions are usually held on occasions such as important Royal anniversaries.” So essentially it is up to Liz who can and cannot be a city, and thus we have the likes of upstarts such as Truro, Lichfield and Preston who can now carry the title. According to my rough calculations, if every football club who played in a city carried the name “city”, there would be double the amount of teams than there are today. But it is still quite rare for two City’s to meet – to battle over who is a true city (according to Cambridge) and which ones have just sent the Queen a nice Christmas hamper each year. In the Blue Square Premier the four City’s, Bath, St Albans, Worcester and Chelmsford all proudly own Cathedrals. In fact BritainExpress.com guide to cathedrals says Chelmsford’s has “splendid new organs”. So a meeting against the second largest church in the UK, St Albans would be a battle of heraldry surely? After a morning of smashing up more concrete (now in week three of this tiresome task) CMF had given me the afternoon off, and with absolutely no interest in the latest FA money making scheme of a high profile friendly against the 54th highest ranked country in the world, Slovenia (higher than Wales granted, but lower than Burkina Faso, Venezuela, Honduras and Gabon) I looked into the footballing crystal ball and out popped Bishops Stortford v Bath City. Brilliant. Less than an hour’s drive, easy to find from the motorway and a club house where I could have a beer whilst watching the game whilst Lolly took up her new job as TBIR’s official photographer. All was going according to plan until an accident on the M11 just before the M25 junction ground us to a halt. My TomTom at that point picked up a traffic report and told me to avoid that section of the route, and the new route involved doing a U-Turn on the M11 and driving back down the wrong carriageway (last week it tried to get me to cross a railway line on a foot bridge in Enfield). We needed a plan B, and a quick call to TBIR HQ had a list of alternatives, a sum total of one – Chelmsford City v St Albans. And so that is how I ended up there. Not through design, more divine intervention. TomTom redeemed itself by guiding us to Melbourne Park, home of Chelmsford City since 2006. Set to the north of the “city” in the middle of residential roads it is not a stadium I would be keen to watch my football at. This is one of two “multi-purpose” venues in the Blue Square South this season (the other being Newport County) which means it is a blooming big Athletics track! I have stated in the past how I hate watching games here as they always tend to be poor quality. The club previously played at the New Writtle Street ground from their formation in 1938 until 1997 when the club was made homeless and shared grounds first with Maldon Town and then with Billericay Town at their New Lodge ground. 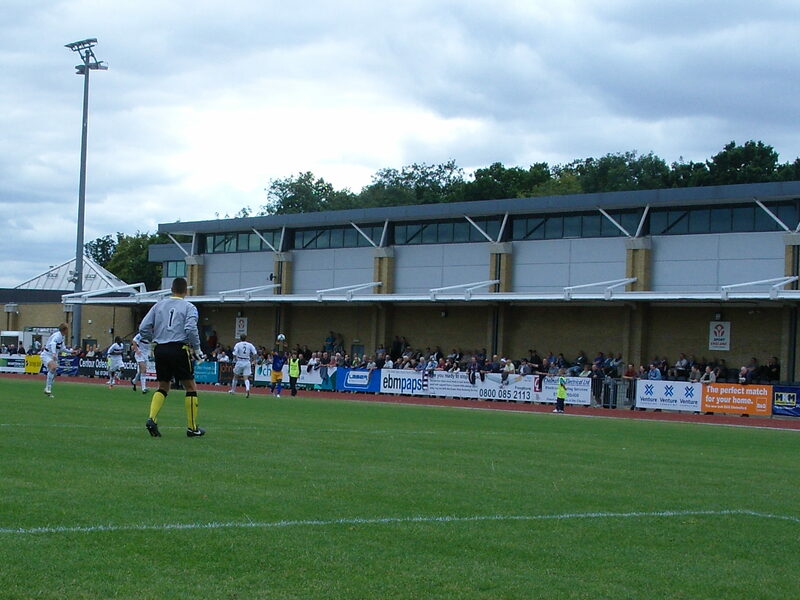 In January 2006, the club moved back home to Chelmsford at the Melbourne Athletics Stadium, which is within Mebourne Park to the north of the city centre. Whilst it is nowhere near the biggest ground in the league, the club get the highest average attendances, which this season is near 1,400. 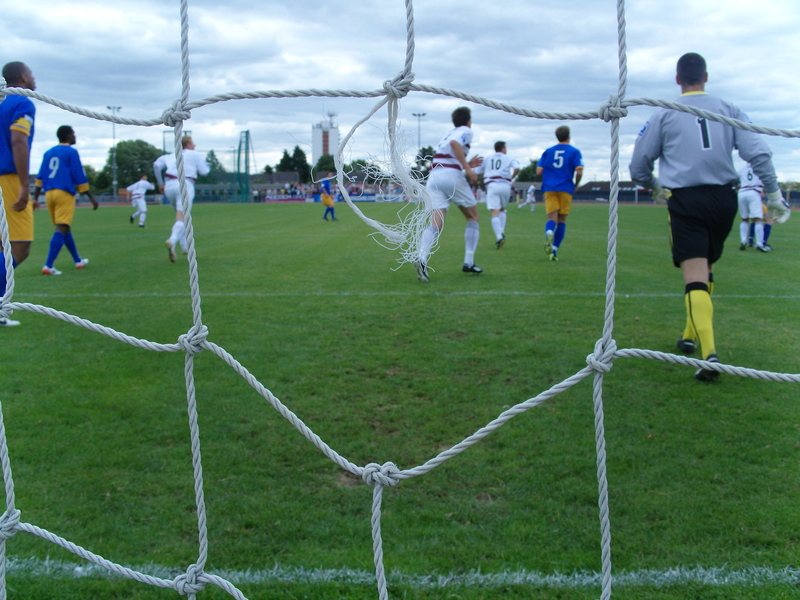 The club have recognised the playing arena is not ideal for spectators, and have installed temporary terracing behind each goal, which allows for the fans to swap ends at half time. These steps are close to the pitch. In fact they were so close that Lolly was able to continue a conversation with Chelmsford’s Keeper Craig Holloway throughout the game. We also noticed a couple of large holes in the net, which would have struggled to hold a decent shot – good to see the “assistant” referee do his job well.Further work is still required to bring the capacity up to 5,000, the requirement if they do get promotion to the Blue Square Premier, although the ambitious board would like to have a ground of their own in the not to distant future. The club are still relatively new at this level, having only been promoted to the Blue Square South at the end of 2008, and last season they made an immediate impact, finishing in 5th place although a 3-1 defeat to Hampton & Richmond in the play-offs heralded a disappointing end to the season. The club had played in the highest level of the non-league pyramid for decades right up until the late 1970’s when they fell down the league structure. After buying our now obligatory golden goal tickets, and a fantastic Bubble & Squeak, Bacon and Egg Bap – aka “Doreen’s special”, we took our place with the dozen or so St Albans fans behind the goal, including the four Norwegian St Albans fans who had made the trip over from Oslo for the day via Stansted on the new route from Oslo Rygge which is only an hour away from the city centre as opposed to the two hour trip from Torp. OK was it any surprise it wasn’t a classic? Chelmsford did enough, battled harder and created the chances in a game that was spoilt by inconsistent refereeing that ended their 3 game losing run. The open exchanges failed to reveal who would finish on top, with both teams reluctant to push forward. St Albans were well marshaled by the giant centre back, Luke Thurlbourne, and his tussles at set pieces with the taller Chelmsford defender Ben Martin livened up proceedings. In fact Thurlbourne and Adam Everitt were already in the referee’s notebook before the home team took the lead. 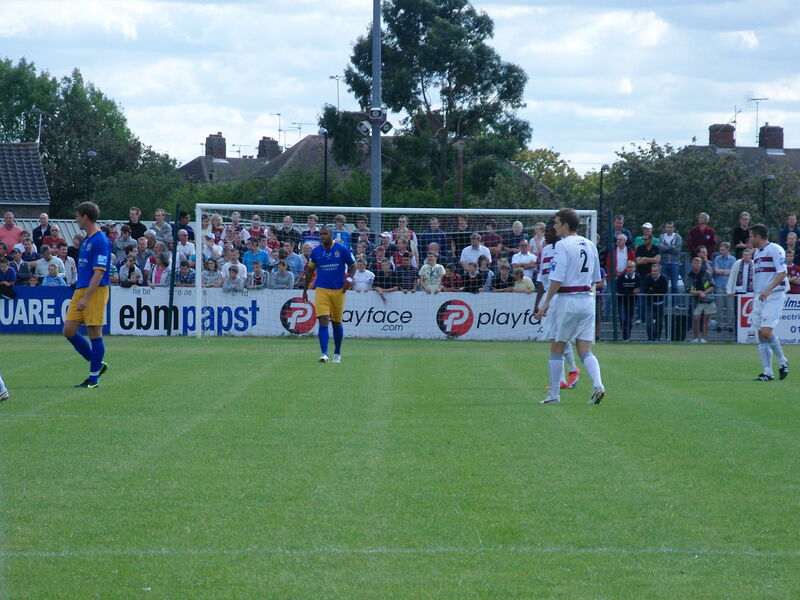 Chelmsford’s Cook put the ball in between the two St Albans centre backs and Murray slide the ball home. We eagerly opened our Golden Goal tickets to see we had missed the prize by just 2 minutes. Still at least we could win 2nd prize if the next goal waited until the 85th minute. Half time came and the mass exodus from behind the goal started. Holloway came out and invited Lolly to come and play in the goalmouth with a bucket and spade as there was so much sand there, and confident of not being disturbed a spider started weaving a web in the Chelmsford goal, christened Dave by Lolly who was now back from her photo taking adventures. “Chelmsford were as comfortable as a side could be with just a one-goal advantage but they still hunted the second they craved to put the result beyond doubt.” They quote on their website, and apart from a golden chance for the St Albans substitute when he headed wide when unmarked in the six yard box it was all one way traffic. Eighty five minutes on the clock and Rob Edmans, the lanky Chelmsford substitute danced through the St Albans defence before placing the ball in the top corner of the net. We were a winner, according my watch, with the second golden goal and a cool crisp tenner. But no, we were overruled and the goal was timed at 86 minutes and 12 seconds. Robbed!Antonio Murray then hit a screamer onto the ball a few minutes later but we had gone by then, inconsolable at our loss. We were back on the A12 within five minutes listening to the final scores. Bishop Stortford 1 Bath City 5…..hmmm and I bet we would have won the golden goal! Is Ozil looking to strike gold with possibly one of his last contract negotiations?